In this series I am combining historic, British, documentary photographs with personal images of my father. 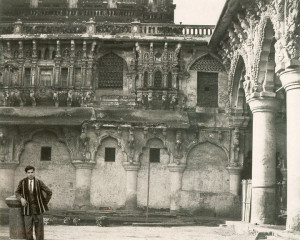 For example one historic British photo void of people, a ruin is complicating by adding an Indian man, my father dressed in Western cloths. This changes the power structure, as these British images of the 1800’s “documented” India as an open-air museum, profoundly in the past, disempowered. As I explore my father’s love of the British Empire and his desire to embody it, I am critically analyzing colonialism and at the same time desiring a discredited history. I find we reinterpret our parent’s lives; their identity is part of ours. I am exploring the politics of representation. This entry was posted in Art, Photography on November 22, 2013 by Sarina.